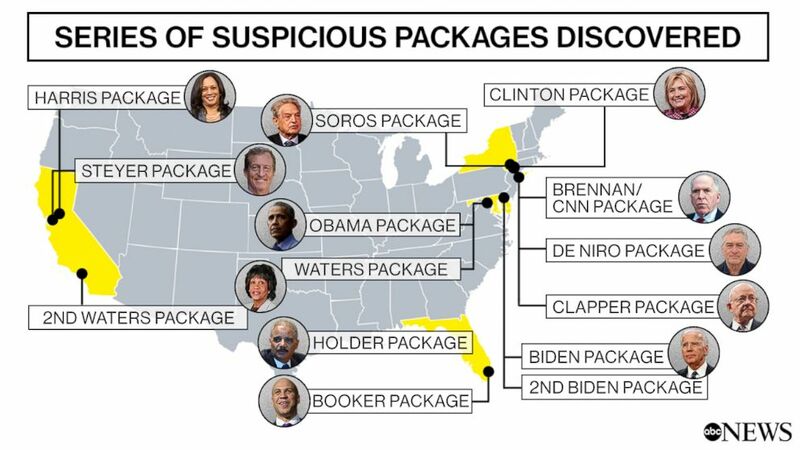 Investigators are frantically looking for clues after a growing list of suspicious packages were intercepted across the country, either on their way or delivered to top Democratic figures -- including two former Democratic presidents -- and others. As of midday Thursday, law enforcement officials have confirmed at least 14 devices have been found. 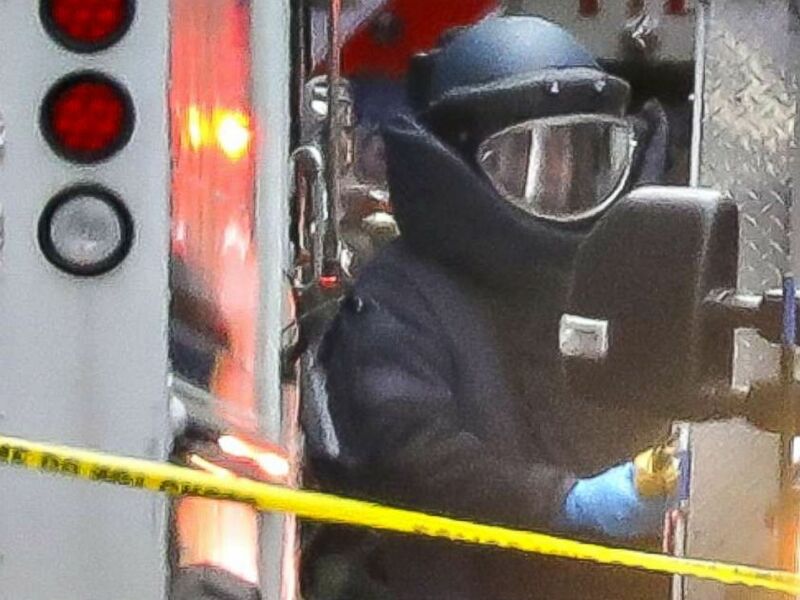 On Wednesday, officials said the packages all contained an explosive device, adding that similar packages could still be out there. The FBI, ATF, Secret Service, U.S. Postal Inspection Service, NYPD and other authorities are investigating. One new package was discovered in New York City on Friday as well as a new package in South Florida, where investigators are paying close attention to a particular mail facility. Two others were found in different parts of California. 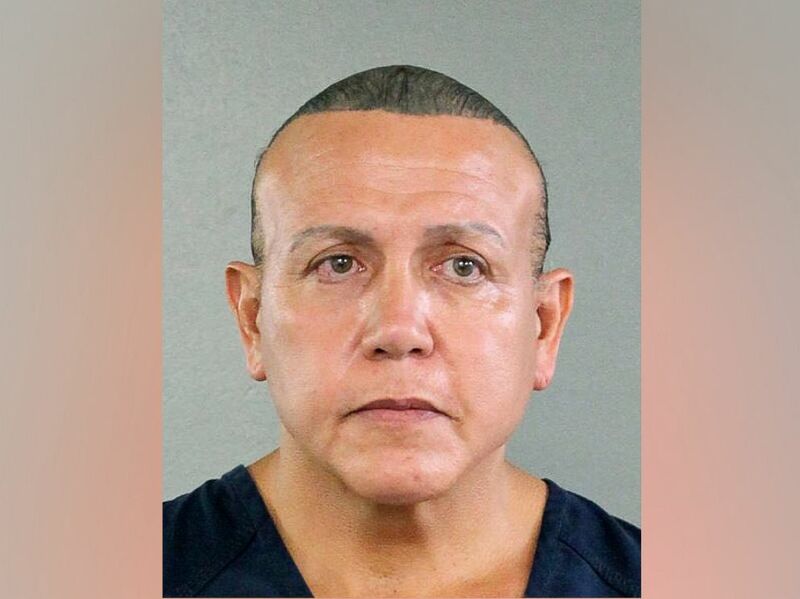 Authorities reported Friday that one person is in custody in connection to the bombs. A suspicious device is found at the home of billionaire philanthropist George Soros. His home is located about 50 miles north of Manhattan, in the town of Katonah, which is in Westchester County, New York. The device was found to be a pipe bomb loaded with explosive black powder and is believed to have been hand-delivered to Soros' suburban home. 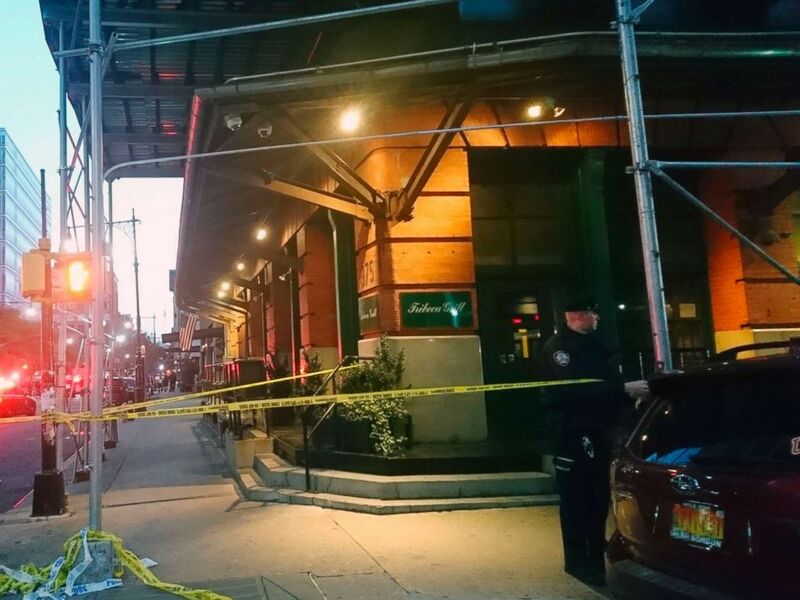 The bomb was found by a property caretaker for the billionaire, a law enforcement source said. The caretaker told investigators he noticed a suspicious envelope as he was walking toward the house. He dropped it in the woods away from the residence and called the Bedford Police Department, which sent officers to the scene. Financier and philanthropist George Soros attends the official opening of the European Roma Institute for Arts and Culture (ERIAC) at the German Foreign Ministry on June 8, 2017 in Berlin. 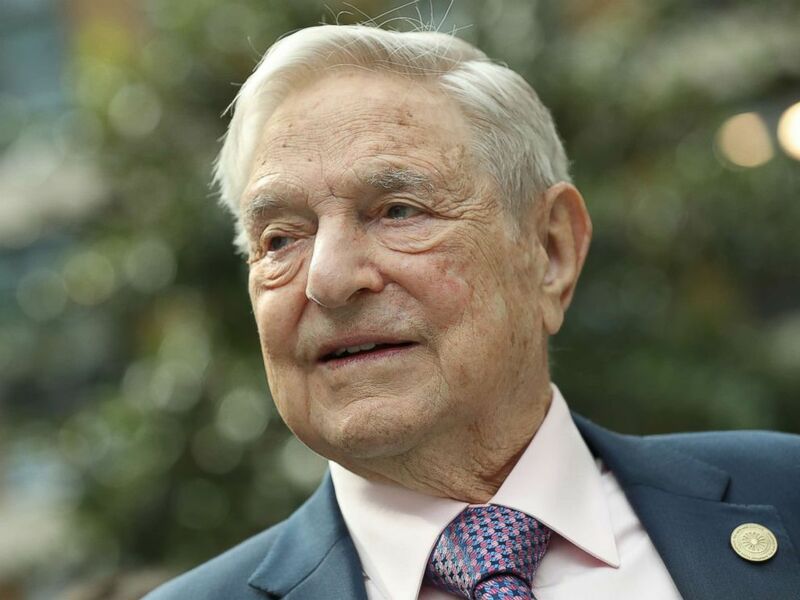 Soros, 88, was not home when the device was discovered, and no one was injured in the incident. An aerial view of the Clinton's house in Chappaqua, N.Y., on Oct. 24, 2018. The U.S. Secret Service discovered a single package that was addressed to Hillary Clinton on Oct. 23. 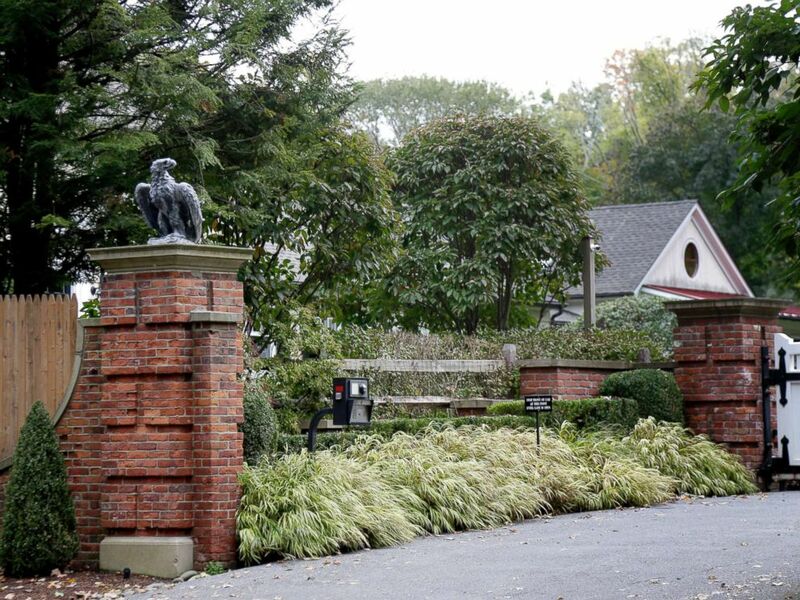 Hillary Clinton, and her husband, former President Bill Clinton, have a home in the suburb of Chappaqua where they have lived since leaving the White House in 2000. Former President Clinton was at home at the time the package was found, according to a source familiar with the situation, who also stressed that the package was screened and discovered away from the residence. 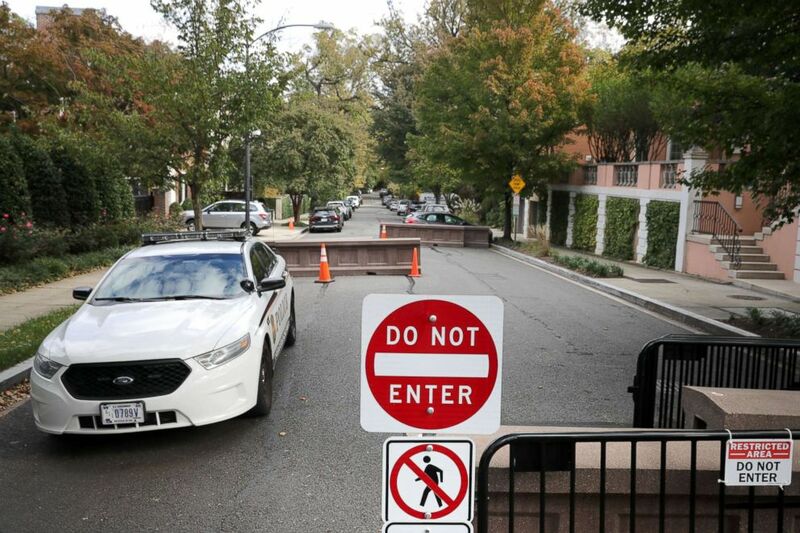 A U.S. Secret Service Uniform Division vehicle stands watch at the end of the block where former President Barack Obama and his family live and where an explosive device was sent Oct. 24, 2018 in Washington. 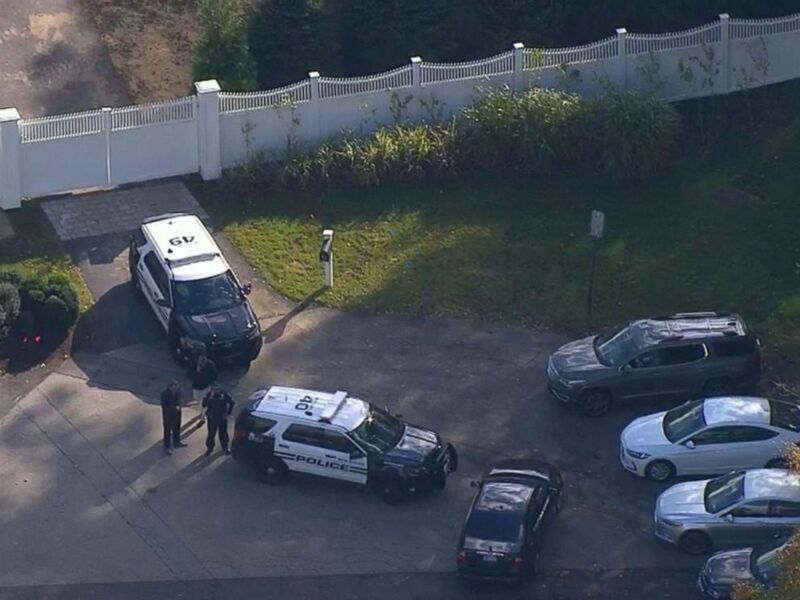 The third suspicious device was found “early this morning,” according to the Secret Service in a statement released at roughly 9:35 a.m. That device was addressed to the residence of former President Barack Obama but it was “intercepted” by the Secret Service. The Naval District of Washington confirmed to ABC News that Joint Base Anacostia-Bolling identified a suspicious package this morning. Joint Base Anacostia-Bolling is home to the Secret Service's mail screening facility for the White House and those under Secret Service protection in D.C. The fourth suspicious package was discovered at 9:38 a.m. at the Time Warner Center in Manhattan’s Columbus Circle. The Time Warner Center is home to CNN’s New York offices. Law enforcement sources report that the package was discovered in the mail room and addressed to former CIA Director John Brennan, though Brennan is a NBC News contributor and has no public ties to CNN. CNN anchors were on air at the time of the discovery and a fire alarm could be heard going off in the middle of the broadcast. A few floors of the building were evacuated, and eventually, the whole building. President Donald Trump shared a tweet by Vice President Mike Pence, decrying the foiled attacks. "We condemn the attempted attacks against fmr Pres Obama, the Clintons, @CNN & others. These cowardly actions are despicable & have no place in this Country. Grateful for swift response of @SecretService, @FBI & local law enforcement. Those responsible will be brought to justice." Pence wrote in his tweet, published at 11:14 a.m.
Trump retweeted Pence's post, writing: "I agree wholeheartedly." Hillary Clinton was in Florida for a campaign event and made brief remarks addressing the news about the package that was intercepted. “Many of you and others across our country have asked after me and my family and I'm very grateful for that. We are fine thanks to the men and women of the Secret Service who intercepted the package addressed to us long before it made its way to our home. Every day we are grateful to their service and commitment... never more than today,” Clinton said. Sources familiar with the investigation told ABC News that a suspicious package was also sent to former Attorney General Eric Holder. The location and status of that Holder package remain unknown. Holder served as the attorney general for former President Obama. Mayor Bill de Blasio, Police Commissioner James O'Neill and Governor Andrew Cuomo give a media briefing outside the Time Warner Center in New York after a suspicious package was found inside the CNN Headquarters, Oct. 24, 2018. NYPD commissioner James O’Neill revealed at a news conference that white powder was also found in the search following the discovery of the Time Warner Center suspicious package. During the same news conference, New York Gov. Andrew Cuomo said that "a device was sent to my office in Manhattan." 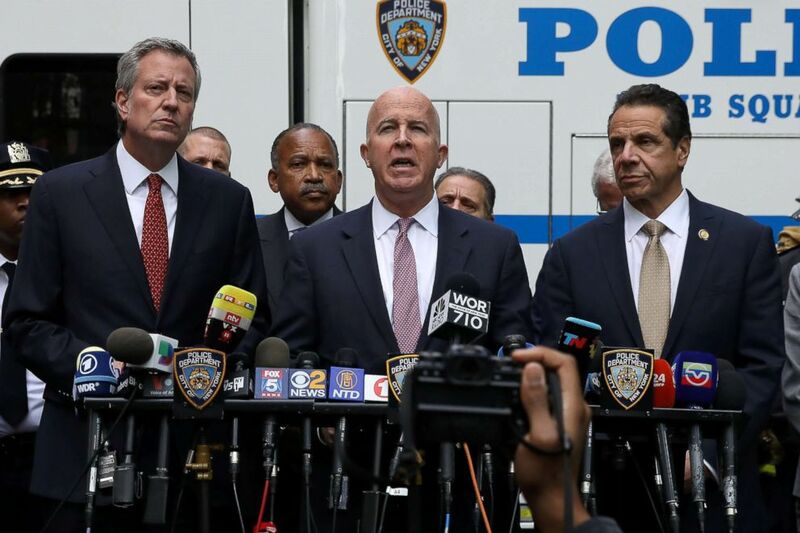 NYPD officials later determined that there was no device at Cuomo's office and reports of a suspicious package were unrelated to the other incidents. "We wouldn't be surprised if additional devices are sent," Cuomo said. Law enforcement sources told ABC News that U.S. Capitol Police are investigating at least one suspicious package containing a possible device that was intercepted at a congressional mail sorting facility in Maryland. The Capitol Police bomb squad responded to the scene. It was later determined that this package had been addressed to Rep. Maxine Waters, D-California. Trump spoke briefly at a previously scheduled White House event, calling the incidents "abhorrent" and "despicable acts." "The safety of the American people is my highest and absolute priority," Trump said, noting that he "just concluded" a briefing with various law enforcement agencies about the packages. "As we speak, the packages are being inspected by top explosive experts and a major federal investigation is underway," he said. "In these times we have to unify, we have to come together," Trump said, adding "that acts or threats of political violence of any kind have no place in the United States of America." "We're extremely angry, upset, unhappy about what we've witnessed this morning and we will get to the bottom of it," Trump said. First lady Melania Trump also condemned the attacks, speaking at the same event moments before her husband. "We cannot tolerate these cowardly attacks and I strongly condemn all who choose violence," she said. 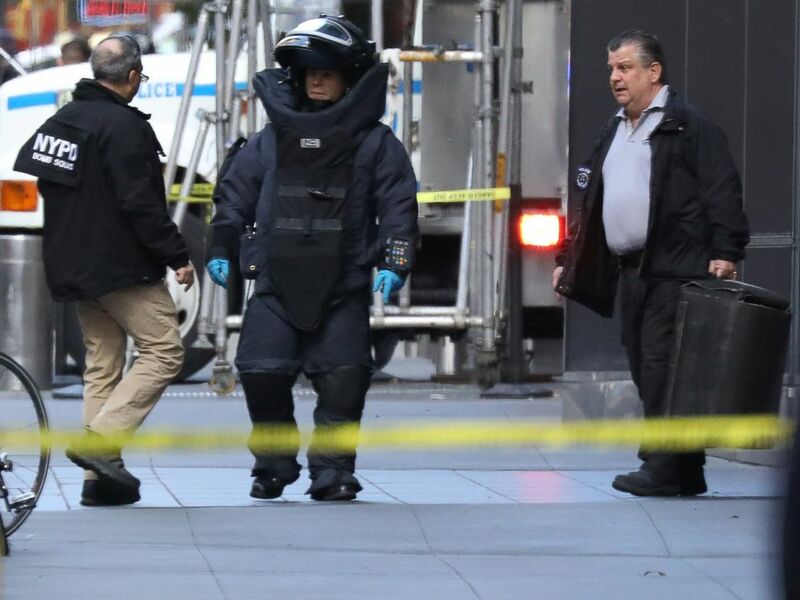 The NYPD confirmed that the earlier suspicious package at Cuomo's office in midtown Manhattan was unrelated to the string of suspicious packages and there was no device inside. Former President Bill Clinton made his first public statement, praising the work of the Secret Service. "Thank you to the @SecretService and all law enforcement agencies who responded to this week's incidents. They work tirelessly to keep our country and communities safe. I am forever grateful for their efforts," Clinton wrote on Twitter. Waters released a statement about the package that was addressed to her congressional office in D.C.
"I have been informed by U.S. Capitol Police that my Washington, DC office was the target of a suspicious package that has been referred to the FBI. I am appreciative of the law enforcement entities who intercepted the package and are investigating this matter. I unequivocally condemn any and all acts of violence and terror," Waters said in a statement. 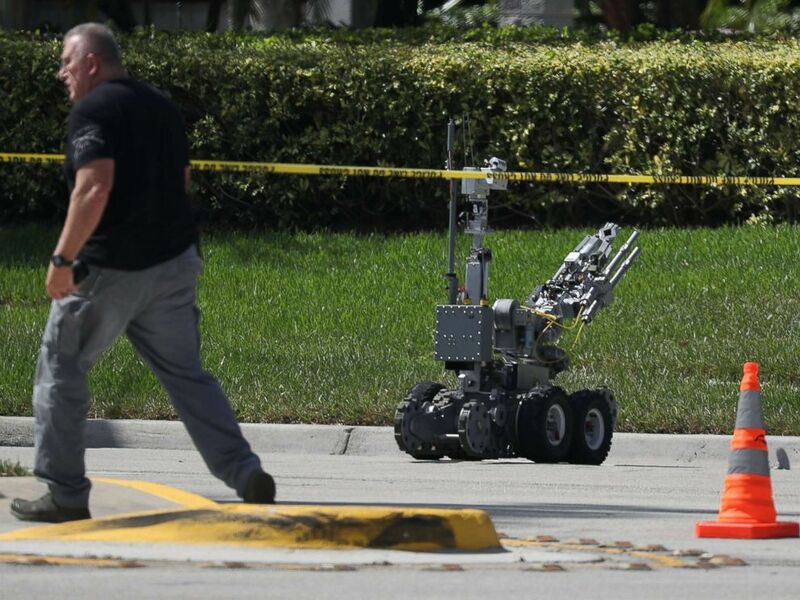 The Broward Sheriff's Office bomb squad deploys a robotic vehicle to investigate a suspicious package in the building where Rep. Debbie Wasserman Schultz has an office, Oct. 24, 2018, in Sunrise, Fla.
Sources familiar with the investigation shared new information about the package that had been addressed to Holder, which was found in Florida. 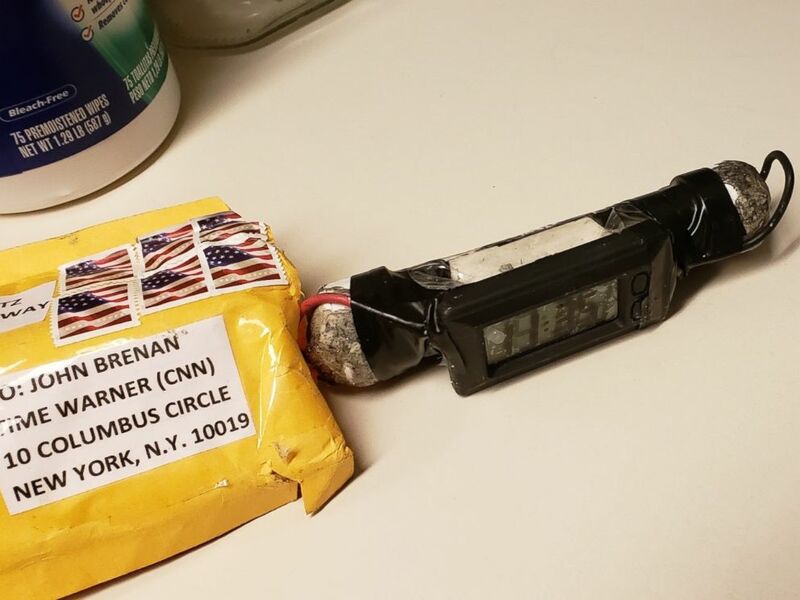 Like the package that was addressed to Brennan, the package to Holder had a return address to Debbie Wasserman Shultz, a Democratic congresswoman and former chairwoman of the Democratic National Committee. The Holder package could not be delivered for some reason, the sources said, and it was ultimately sent to Wasserman Shultz in Florida. It's unclear exactly why the package addressed to Holder couldn't be delivered. 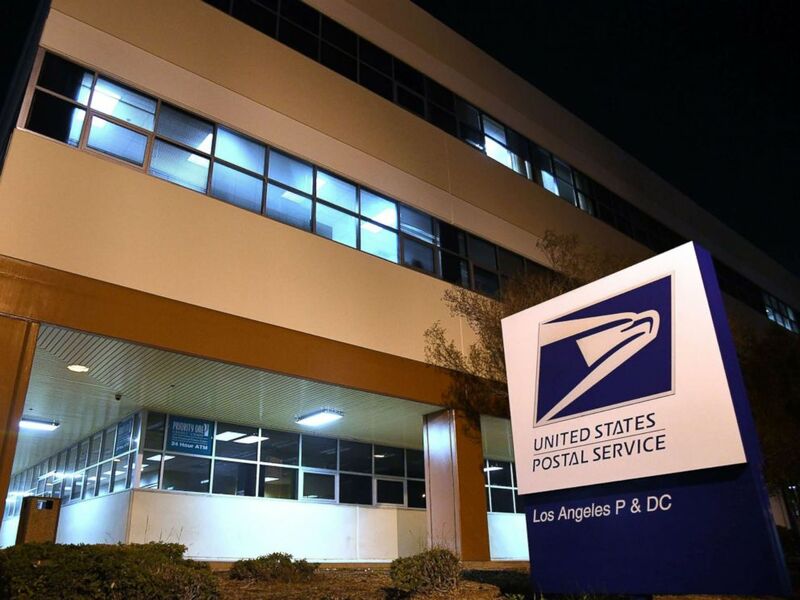 The United States Postal Service (USPS) Processing and Distribution Center (P&DC) in Los Angeles, Oct. 24, 2018. FBI special agents responded to a call at a U.S. Postal Facility in Los Angeles where a package was addressed to Waters. Special agents and bomb technicians are en route to the scene. The FBI had released a list of five packages -- which were addressed to Soros, Clinton, Obama, Brennan and Holder -- earlier in the day but on Wednesday evening, an FBI source confirmed that they were looking into two additional packages. "We have now confirmed two additional packages, both addressed to Rep. Maxine Waters, that are similar in appearance to the other packages," the source said. The first Waters package was confirmed by the congresswoman in a statement earlier in the day, and the second was believed to have been found in Los Angeles, where the California congresswoman has an office. By the end of the day on Wednesday, there had been a total of seven packages confirmed by law enforcement. Security personnel at the lower Manhattan office of Robert De Niro's production company called the NYPD because they had seen a suspicious package addressed to the Oscar winner. The package, found in the mailroom of Tribeca Productions, was similar to those recovered Wednesday. The bomb squad responded and examined the package, with a similar device inside. It was discovered under X-ray. Multiple law enforcement sources with knowledge of the investigation in Los Angeles told ABC News that the package found there on Wednesday night did contain a live explosive device and that the device was consistent with those on the East Coast. The suspicious package found at De Niro's office was removed and transported to the NYPD's range at Rodman’s Neck in the Bronx via bomb truck. A law enforcement source told ABC News that it appears to be from the same sender as the earlier packages. Former Vice President Joe Biden appears to have become the latest high-profile Democratic target, as multiple sources tell ABC News that a package addressed to Biden was found at a postal facility in New Castle, Delaware. It bore similarities to the other packages that were recovered over the course of the past three days. The FBI and ATF responded to the facility as part of the ongoing investigation of improvised explosive devices sent to high-profile figures this week. Authorities now believe this is the ninth package tied to the investigation. The FBI tweeted that the discovery of a second device directed at Biden, which was also found in the former vice president's home state of Delaware, has been found. "The #FBI has confirmed three additional packages, similar in appearance to the others – one in New York addressed to Robert DeNiro, and two in Delaware addressed to former Vice President Joseph Biden," the FBI tweeted. Law enforcement sources told ABC News that the second package was addressed to Biden and was found at a postal facility in Wilmington, Delaware. The FBI and other authorities have responded to that location, according to an FBI spokesman. Federal authorities are chasing promising leads pointing them to South Florida as a suspected origin of at least some of the potential bombs sent to prominent Democrats and others this week, multiple sources told ABC News. The sources said law enforcement agencies are deploying additional resources to the area. 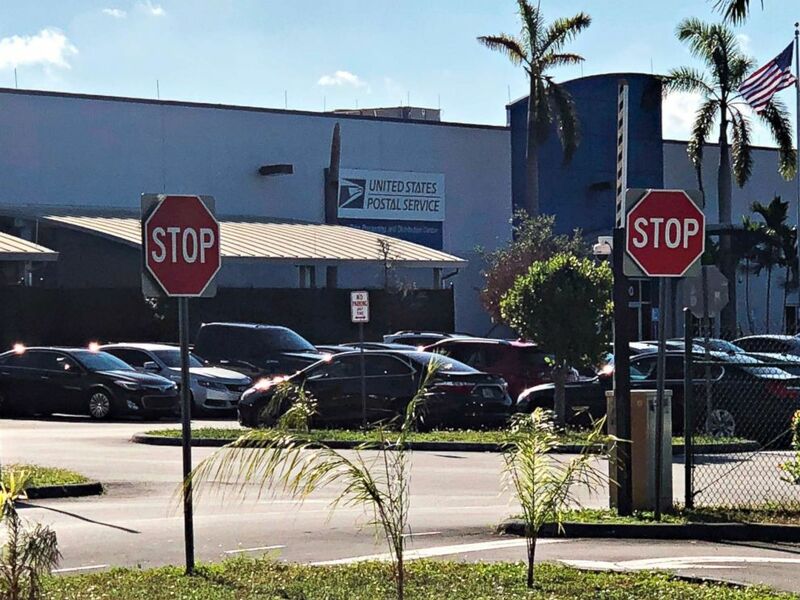 The Miami-Dade police posted on Twitter that its bomb squad was working with federal authorities at a mail facility in Opa Locka, located just west of North Miami Beach. The shops and restaurants in the Time Warner Center in New York's Columbus Circle was evacuated by the NYPD after reports of suspicious packages were discovered. 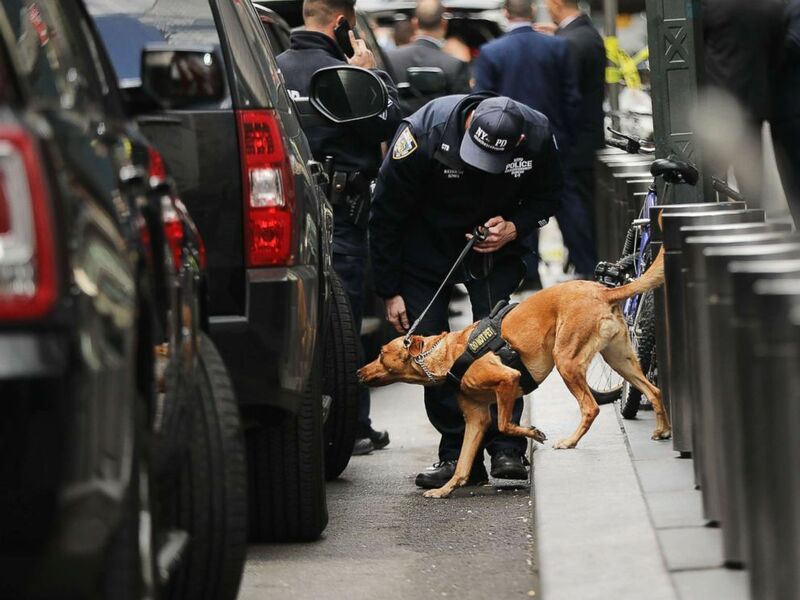 The Time Warner Center, which also houses CNN's New York offices, had been evacuated the day before as a result of the suspected bomb that had been discovered in the mail room. The NYPD announced that "it was a false alarm" after the bomb squad analyzed "a couple of unattended packages inside the mall." The Opa-Locka, Florida, postal center on Oct. 26, 2018, is the focus of an investigation into the mail bombs sent to Democratic officials and supporters and intelligence leaders. A postal facility in Opa Locka, Florida, has emerged as a focal point for investigators trying to track down the sender of the suspected mail bombs, law enforcement sources familiar with the investigation told ABC News. The Opa Locka location is one of the postal centers the packages may have moved through and the Miami-Dade police bomb squad swept the facility at the request of the FBI as a precautionary measure. Investigators were led to south Florida in part by forensic evidence gleaned from the packages and from US Postal Service images of mail that is processed through their facilities. Another package -- the 11th -- has been recovered at or near Opa Locka. That package was addressed to Sen. Cory Booker of New Jersey. A bomb disposal technician carries a package out of a U.S. Post Office facility at 52nd Street and 8th Avenue in Manhattan, Oct. 26, 2018 in New York City. Law enforcement sources told ABC News that the NYPD received a call at 8:14 a.m. for a suspicious package from a post office in midtown Manhattan. The sources said a preliminary assessment indicates one package was found at the facility and it appeared similar to others recovered this week. That package -- No. 12 -- was addressed to former Director of National Intelligence James Clapper. A Department of Justice spokesperson confirmed that a person is in custody in relation to the suspected package bombs. The suspect was tracked using a cell phone, according to multiple law enforcement sources told ABC News. Authorities have recovered a cell phone, a laptop computer and other electronic devices from this suspect. Department of Justice officials are slated to hold a news conference at the Department of Justice at 2:30 p.m. today with more information. The suspect was identified by law enforcement officials as Cesar Soyac, a 56-year-old man based in Aventura, Florida. Another suspicious package was discovered in Sacramento, California, and multiple sources tell ABC News that it was addressed to Sen. Kamala Harris. An FBI Evidence Response Team and bomb techs are on scene along with the Sacramento County Sheriff’s Bomb Squad. The package addressed to Harris marks the 13th suspicious package addressed to a high-profile Democratic politician or prominent figure. The 14th suspicious package was identified, with billionaire philanthropist and liberal donor Tom Steyer identifying himself as the intended target. The package was intercepted at a mail facility in Burlingame, California. 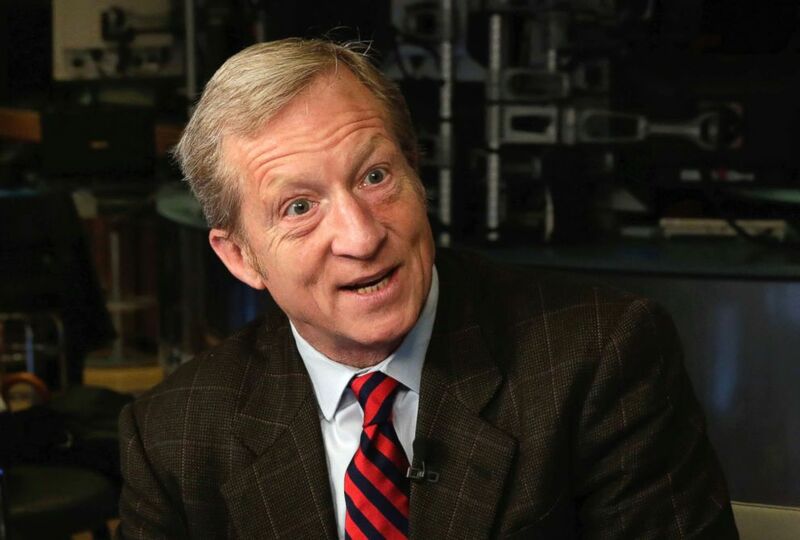 "We're thankful that everyone we work with at NextGen America and Need to Impeach is safe -- that's always our first priority, and will continue to be our first priority," Steyer said in a statement. "We are seeing a systematic attack on our democracy and our rule of law that extends much further than just one isolated terrorist in Florida. Whether it's voter suppression, voter intimidation, attacks on our free press, gerrymandering, or attempted violence -- the trust and norms that are the actual basis for our civil society and political system are being eroded. It's time for the Republican Party to denounce any attacks on the rights and dignity of any American and begin to work on building the broadest and most comprehensive democracy possible for each and every American," Steyer said in the statement. 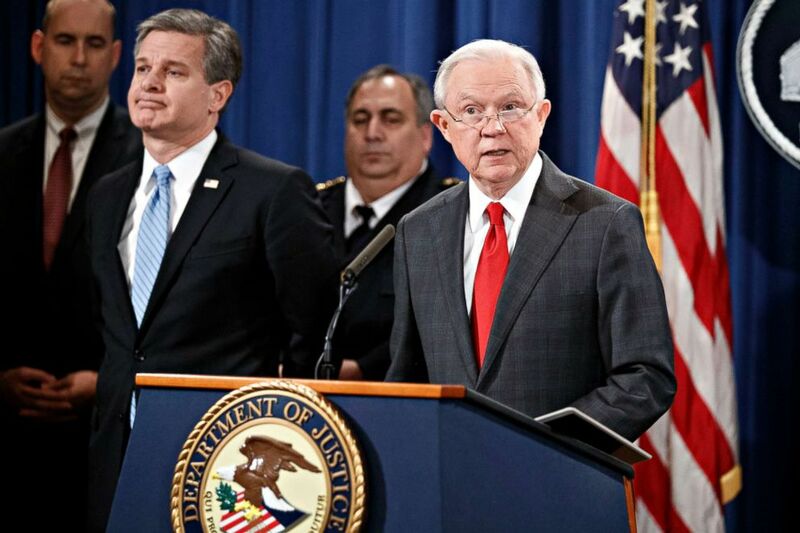 Attorney General Jeff Sessions delivers remarks on the apprehension and arrest of mail bomb suspect Cesar Sayoc jr. during a press conference at the Department of Justice in Washington, Oct. 2018. All told, those charges could lead to 48 years in prison.